Nothing bad ever came out of a German beer hall, especially not in Munich, between the years 1923 and 1924. Nothing. 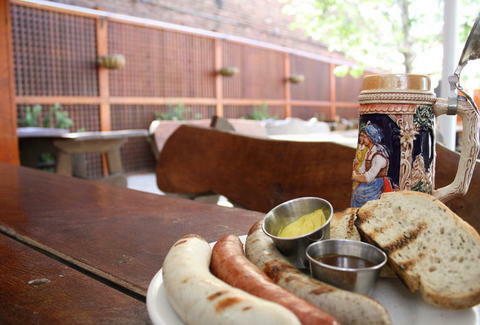 Hoping to continue pustch-ing that trend forward: Biergarten Haus. Finally opening this morning at 9am, the long-awaited Haus is a 7000sqft bastion of Bavarian revelry, with twin darkwood upstairs/downstairs bars backed by rows of ornamental steins and mounted deer heads, plus a gorgeously wood-fenced, massive outdoor suds oasis with sturdy wood tables framing a picturesque fountain, all from the owner of Dupont's Ruski-themed Russia House, also a show in which a doctor performs miracle surgeries without the aid of a functioning healthcare system. ~30 Germanic brews include drafts from the golden amber Franziskaner Hefeweizen to the 7.2% abv Spaten Optimator Doppelbock, while available in 16.9oz monster mugs are "Strong Beers" (like the 9.0% Ettal Curator), lighter "Weizen Bier" (including the slightly tart Ayinger Brau Weisse), and two kinds of a weiss-variation called "Kristall", regularly consumed by German rappers right before "making it rhein". The food's equally Bundes-legit, with highlights like a three-wurst sausage plate (w/ pork/caraway/garlic Bratwurst, pork/beef Knackwurst, and white pork/veal Weisswurst); "traditional entrees" like a mustard-rubbed, rotisserie pork shank called a Schweinshaxe; and schnitzely goodness like your standard, lightly breaded Wienerschnitzel, and the mushroom/bacon/onion/wine-sauce Jagerschnitzel, which the lax team enjoys dropping into RedBullschnitzel. For your World Cup viewing pleasure, they've also got the garten stocked with massive projector screens all tourney long, marking the first time something bad came out of a German beer hall: soccer.